Although photography may be top of mind when you think of Glamour Shots, we’re just as proud to offer exceptional makeup artistry for our clients. Our full-service photo sessions begin with a makeup artist helping you look and feel your very best. Our artists are experts in the latest looks and products, and they want to help you feel beautiful in your own skin. 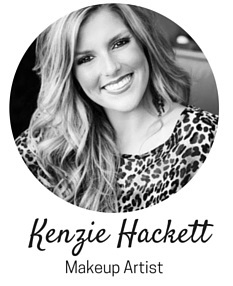 We’re taking a look into the makeup bag of Kenzie Hackett, who has helped dozens of clients at our Oklahoma City studio achieve their best look, to see which products she’s loving and using herself. With 24 shades of flawless coverage, Urban Decay’s liquid makeup helps create a perfect canvas for any look. A long-trusted beauty brand, Merle Norman Cosmetics focuses on the highest quality ingredients for their products. Their sheer face powder works on all skin types to help finish your look. The Everlasting blush by Kat Von D is appropriately named – it’s great for all-day wear and one compact should last you well past your money’s worth. Whether you buy an individual color or several in a palette, Makeup Geek eyeshadows come in every color of the rainbow in both shimmery and matte. Stila offers Mile High Lashes™, Huger Than Huge, and our personal favorite, Glamoureyes mascara to lengthen your lashes and make your eyes really pop. The Bobbi Brown Art Stick offers lipstick and liner all in one, with 15 bold and creamy color options. “I love makeup and how it makes me feel once I have it on, but girls do not need to wear makeup to feel beautiful, feminine, or accepted. If you wear makeup it should be because you enjoy doing it.” – Kenzie H.
Your Glamour Shots photo session is a way to celebrate who you are. Makeup is simply a tool to help you achieve a certain look, but at the end of the day, your personality and heart are what we aim to capture in your photographs. It’s absolutely okay to want to feel beautiful and to want to capture those memories for yourself. Book a session today and let us help you have the beauty experience you deserve.